Learning to play music should be fun. It's called 'play' for a reason. Students feel motivated by playing with their peers. A student's individual music instruction should be supplemented by jam sessions and playing in a band. Like a sports team, a band builds teamwork, develops social skills, fosters self-esteem, promotes peer recognition, and leads to lasting friendships. Students learn faster playing music they like, whether it’s Rock or Bach. And the technical foundation is the same. Students are motivated to learn when they see early results and have an exciting, achievable goal. Introducing toddlers and very young children to music instruction, rhythm, and motion supports cognitive development, learning, and motor skills. We base our method of music instruction on the knowledge that students learn best when they play the music they enjoy most. That’s why we use special arrangements of today's music to help students become proficient instrumentalists or vocalists as well as seasoned performers. At B2R Music, individual music instruction is combined with band instruction that leads to regularly scheduled public performances, "Battles of the Bands," and recording sessions in our professional sound studio. The real fun begins within just a few months of music instruction. By combining musical basics with rigorous performance standards, we enable students young and old to play together in bands, using a repertoire built upon the hit music of their generation. 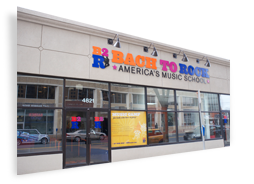 B2R Stands for "Bach to Rock"
As students develop their skills through music instruction, they can go any place their musical interests take them — Rock, Pop, or Classical — the works! Moreover, the experience of performing before audiences in bands from the beginning is an exciting component of music instruction — building self-confidence, garnering peer recognition, and providing a strong social incentive for continued progress. Music instruction and musical skills lead to many years of pleasure and satisfaction. Young people who learn to perform music with others find their musical accomplishments enrich their lives forever. All our students achieve great personal satisfaction whether they play or sing professionally or perform for their friends at social gatherings, jam with their friends in bands or combos, or share musical interests with their families. They find that music instruction leads to a rewarding social and artistic pastime. "Every person we have encountered at our B2R has been outstanding, over and above anything we could have ever asked for!! We LOVE it and look forward to being here for years to come. Thank you so much!" "I am a great fan of the administrative and teaching staff at B2R. Everyone is warm, professional and invested in my child who has been there for a few years now. The support and enthusiasm is wonderful! My son has growing confidence in his abilities and continues to have great joy in music. We all feel fortunate to be able to give these experiences to our son." "I was very impressed when I first saw B2R, but honestly, the staff is why we have stayed. They are so good with Jacob and so friendly to deal with. Even I look forward to his lesson time!" "My child had a great time and would go back. Even his younger brother asked if he could take a class after seeing his older brother in camp."